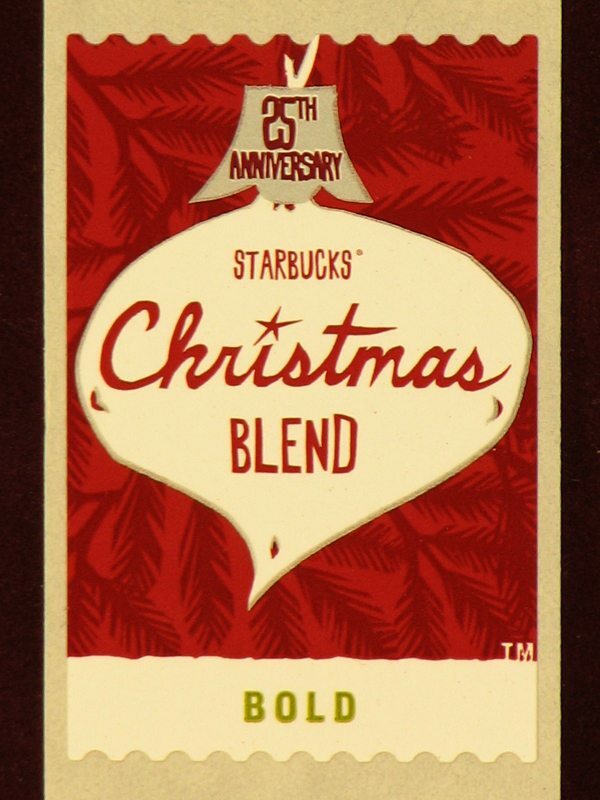 First introduced to the Starbucks whole bean line up, November 1984, Christmas Blend is still a favorite. The coffee beans in Christmas Blend are from Latin America, Asia/Pacific and Sumatra are first roasted separately and then blended together to create this special flavor. Most coffee blends are not roasted separately and then blended post-roasting. This coffee is unique because the Aged Indonesian and Aged Sumatra beans in it demand separate roasting, creating one of Starbucks very few blends actually blended AFTER the roasting is over. Aged Indonesian beans are known for their unique spicy and syrupy flavors. I have a very complete blog post here describing the unique sourcing involved in Sumatra and Aged Sumatra. This year’s Christmas Blend is available in 3 sizes: 8 ounces, a full pound size, and a 1.5 pound size. It is also available in decaf; I don’t pay too much attention to the decaf offerings, but I find that interesting that this coffee is available as decaf since there is no way to buy separately, ‘decaf Aged Sumatra’ beans. This special coffee definitely is a winter favorite! Don’t be confused though! It may also be sold in stores as “Holiday Blend” with very different packaging but the beans inside are exactly the same! (At least I’ve been told that Holiday Blend is the same coffee – If anyone knows differently, please let me know. Thanks). Mini preview of Roy Street Coffee and Tea (Inspired by Starbucks) - Opens tomorrow morning. mobile comments ftw! i finally saw the new holiday decor tonight. puts me in an odd mood. still waiting to smell this years xmas blend though. Wow, this is coming early. Didn’t Thanksgiving Blend just come out? (Poor Thanksgiving never gets any attention). Starbucks always gets me into the Christmas mood. Can’t wait to try it!!! And for that matter, what are the new things coming out? And the new drink is caramel brulee, right? I think Christmas Blend may be my favorite of the seasonal blends (Anniversary, Thanksgiving, Christmas). It just has an extra zing that the other two lack. I’m always eager to learn more about what goes into each blend, so thanks (as always) for sharing! Christmas Blend is also sold as “Holiday Blend” in some areas, and it is also sold as “Winter Blend” in some retail locations. Here in Canada we’ve had Christmas Blend since November 3rd. I think it’s too early, because then by Christmas, I’m a little tired of it. 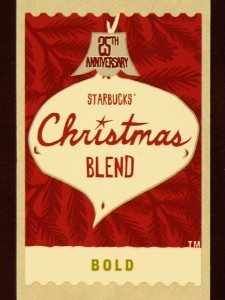 I’ve always loved the Christmas Blend (Holiday Blend what have you). I can’t define exactly what it is that I love about Starbucks…the coffee was good then questionable and I’m starting to fall in love with the coffee all over again with the newer roasts and getting reacquainted with a few of my old favorites. I was thinking about the holiday roast the other day having received the Thanksgiving Blend and was wondering when that would come out again…so SOON and I shouldn’t be suprised LOL. And because your reviews of the different coffees and lattes got me motivated to reach outside my coffee box…I tried a pumpkin latte for the 1st time today at our Bellevue Square Starbucks…OH NOM!!! Interesting about the beans being roasted separately and then combined. What are the other blends that are roasted separately? Do they involve the same beans or are there others that also need to be done that way, too? The Christmas Blend I had last week was excellent. Caffe Verona is also blended this way. It’s called a post roast. Verona is an 80/20 blend of Yukon Blend and Italian Roast for added depth and sweetness. I’m not exactly sure what we have been doing since we took Yukon Blend off the shelves… But we recently brought it back as Organic Yukon Blend. I like it as a sturdy cup of coffee. Verona and Anniversary are the only other blends that are blended post-roasting. Melody, GREAT JOB, as always, on the post. Lots of helpful info from you and your commentees 🙂 You know I was hoping you’d do a blog post on the Christmas Blend– great jumping off points for our store’s December coffee tasting! @Katherine the Christian Siriano card is out and really, really cute, and the Caramel Brulee Latte is GREAT– very nutty. We have had Christmas Blend for over a month here in the UK. Already gone through the bag I bought in October. Enjoying drinking Pike Place at the moment which I brought back from the USA. Strangely it is not sold in the UK. That looks like some mighty fine coffee! So how do I win some? I’m guessing that leaving this comment puts me in the running? I sure hope so! This is my favourite blend. Thanks for the info Melody, i feel better informed.